Wendy brought this little Pademelon to WIRES after finding her in her dead mothers pouch. Unfortunately she did not survive, her injuries were too severe. Thank you for taking the time to stop Wendy, this joey was spared what happens when they are left, ants, cold, starvation and prolonged pain. This story is for Angela, the rescuer of "Lily" a Red neck wallaby joey. Angela stopped for a dead wallaby in the middle of the road to check the pouch and there was a little face of a just January 10, 2016 took the joey to Lismore veterinary clinic where she was checked for injuries and given fluid subcutaneous as she was quite dehydrated she also had some minor cuts and concussion. She was brought in to care with a WIRES Northern Rivers macropod carer and she is now recovering in her substitute pouch slowly getting used to her new environment and recovering her strength. She has time on her side as she is not quite 7 months old so she will spend months yet before she will leave her pouch for good, she will then stay in care till she is about 15 months old before being released back in to the wild. We will keep you up to date as to her progress.To Angela, thank you for caring and stopping to check a dead animal, Lily would not have survived on her own.She now has a chance at life thanks to you. It is with great sadness I have to report that Lily did not survive her injuries, her head wound was too severe, and she died in care. As carers it never ceases to amaze us as, how some animals manage to survive and come in to care. The story of Kessy the Mountain Brushtail Possum I think warrants mention as one of the memorable ones.This little female was found by a tourist from Germany, he was driving through Mullumbimby on a cold winter evening, when he noticed this tiny possum walking along the road, as the car lights picked her up he stopped to investigate what it was. Not knowing anything about Australian native animals, he knocked on the door of the first house, and the occupants were able to tell him that it was a tiny possum. Her fur had not yet grown, and her eyes were still closed, how she had not gone too cold is a wonder. As to what happened to her mother we have no idea, she was never found. When she was brought in to care she was in fairly good condition although cold, she was immediately given warmth and nutrient and have since thrived in Lee's care. Her eyes opened 2 weeks later, and she is finally starting to grow some fur. Possum joey's this age would normally still be in Mums pouch, and do not normally leave the pouch even after Mum has passed away. Two more Mountain Brushtail's of same size have since come in to care, they are growing up together, and will eventually be released (as long as all goes well) as a family group consisting of two females and one male. To read more about Kessie and her new friends, please click here. One juvenile Ringtail possum came in to care after a cocos palm was cut down, the drey ( being the home Ringtails build) was situated in the crown of the cocos palm. The little juvenile was flung out when the palm fell, unfortunately the property owner were not able to locate the drey or the mother and possible siblings. The little one weighing 125 gram was brought in to care. Two weeks later another juvenile female ringtail was found clinging to the side of a house. Unfortunately she was dehydrated indicating that she had been orphaned some time before being found. She was similar size as the one already in care, so they are now growing up together. It is always better for any native animal to have one of its own kind to grow up with, these two will be raised and released together as long as all goes well. Coco and Nut has now been soft released, this means that they are able to come and go from the release site, this enables the possums to leave permanently when they are ready, not when we think they may be. These pictures taken shortly before release. This young Red Neck wallaby joey is currently in care with WIRES, being so young he is kept in a humidicrib and fed 4 hourly day and night. He came in from a motor vehicle accident, mum was killed on impact. He will be in care for about 12 months, and we will keep you informed of his condition. So far he is doing well, being brought in to care shortly after the accident certainly gives an animal this small the best chance of recovery. Thank you to Roo for bringing him in to care. To read further on Nicki's time in care, please click here. These two tiny Sugar gliders are currently in care with WIRES carer Tennille, we do not know how or why they were orphaned, they were delivered to a local veterinary surgery with no explanation.We are happy to report that they are both doing well. The main reason for small animals like this coming in to care is unfortunately cat attacks. Right now due to the draught, there is also reports of Sugar gliders being found dehydrated due to lack of available water. If you live in an area where these and other native animals may not be able to find water, please consider putting out a dish of water. Change the water regularly, and make sure it is out of harms way from domestic pets. Sugar gliders normally have more than one young, so should you ever find an injured adult female Sugar glider, please check the pouch if only one young is found, have a look around as there may be one or two more hiding close by. The two Sugar gliders have now been released. This little Red neck wallaby came in to care 18.7.04 weighing just over 1 kg. Her mother was hit by a motor vehicle and unfortunately died, the driver stopped and retrieved the joey and she was brought in to care with WIRES carer Sue. The joey is doing well so far and will be in care for about 7 months, as long as all goes well. Picture is after one month in care. This Tawny Frogmouth is currently in care with WIRES carer Iris ,it had been found early in the morning by a member of the public in Lennox Head in their front yard, squeezing into a corner of their house. Some of his feathers had been lying on the ground at the top of the driveway from where he seems to have made his way 10 m. down to the house. The veterinarian had found that the bird had suffered a fractured bone close to the joint, maybe due to clipping his wing on a telegraph pole, or a car. It had good chance of healing so the wing had been strapped. When the strap was removed, the wing was as stiff as a board. The bird needed some adjustment time, simply by himself moving about and stretching the wing, and by building up condition in the flight aviary. Usually Frogmouth's do not feed them selves and the carer has to force feed. In this case, he was so strong, tightly squeezing his beak, that it was impossible to do so. A new strategy had to be devised: Coaching him to open his beak- throw ball of feed in- repeat- and soon he has learnt to feed while in care. The Tawny frogmouth has been released, he flew off beautifully! First he flew only 70m or so close to the ground and sat there, but when I approached him he turned around and flew into the scrub, raising above the bushes and little trees. Interestingly, the last week in care he became more and more impatient with being in captivity - it seemed he was getting ready to leave. I was just waiting for the weather to clear up and stabilise. Brandon rang WIRES regarding an Echidna in his back yard, he had noticed it was injured on the shoulder. WIRES carer Alicia went to the rescue, and the Echidna was taken to the vet. During surgery at the veterinary clinic it was discovered that the Echidna was not suffering from an injury, but from Lymphoma, and it was humanely euthanased. It would not have survived for much longer in the wild, and the vet was at least able to end its suffering. Thank you Brandon for being so vigilant and caring for our native wildlife. This little juvenile Mountain Brushtail possum came in to care after a car accident. He would most likely have been on mums back, although mum was not found. Fortunately his injuries were not too severe. He was taken to the vet where he had surgery to his mouth, and is now recovering in Matt's care. We will keep you up to date with his progress in care. Thank you David for stopping, and calling WIRES for help. "Jack Black"as Matt named this juvenile possum, has now been transferred to WIRES carer Rooella as he needed a larger aviary to build muscle, and forage in at night. Rooella is also on large acreage in the country where this little fellow can hopefully be released when he is old enough to fend for himself. "Jack Black" has been released, he is still coming back to his aviary now and again, but time will see him venturing further afield as he gains confidence. WIRES carer Joe has "Basil" the common Brushtail possum in care, he came in on 12th August as a very small fellow. He has had some problems, but is now getting stronger day by day as you can see in this picture. He had some gravel imbedded in his tiny shoulder, and since that has come out, he is feeling a whole lot better, he still has a long road ahead before he is ready for release, but with his strength of character and care from Joe, he certainly has a good chance. "Basil" has been transferred to WIRES carer Sandra, where he will spend his remaining time in care, he is doing extremely well, and will be released when he is old enough to fend for himself. WIRES carer Alicia rescued this unfortunate Mountain Brushtail possum after a call from Chris, he had found the possum in his chicken coop. How the possum was injured we do not know, the injury was however much too severe for any chance of recovery and he was humanely euthanased. Thank you Chris for calling, thus allowing WIRES to end the suffering of this animal. Late at night is the most common time for many native animals to come in to care, possums are active at night, and if crossing the road at the same time as a car is driving past, trouble is not far away. This little Mountain Brushtail was found after his mum was hit by a car. WIRES carer Aline went to the rescue, unfortunately the mother possum was already dead, but this little fellow was found in mums pouch, quite unhurt. Aline expertly removed "Lucky" from the pouch, and he has been in Aline's care since. He is about 4-5 months old, and will spend many months in care before he is ready to make it on his own in the wild. Lucky is now almost ready for release. He was transferred to a large aviary on WIRES carer Julia's property some time ago, here he will meet the resident population of possums before his release in about 5 weeks time. Pam was alerted by a friend that some very young Eastern Rosella's were in trouble. 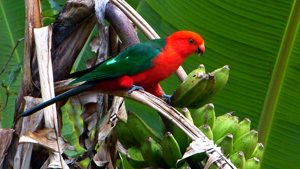 Her friend had been watching with delight a family of Rosellas that had made their nest in a fence post close to her house. Knowing that the young chicks had hatched only days before she was shocked to find feathers all around the fence post. She had for some time been trying to trap a feral cat known to be in the area. It was unfortunately too late for these Eastern Rosellas. Pam went to the rescue, retrieved the chicks from the fence post, and called WIRES. Due to unforeseen circumstances we were not able to get to Pam's place straight away, but as luck would have it Pam is an experienced bird breeder, not only did she have the equipment needed to feed these specialised chicks, but she also had the special food they required.We are extremely grateful to Pam for her help, and initial care of these chicks. They are now in care with WIRES, their eyes are opening 5 days after coming in to care, and what a delight it is too have the privilege to care for such beautiful creatures. At this stage they look very prehistoric, but like in Hans Christian Anderson's fairytale, they will grow up to be some of the most beautiful birds in the Australian bush. Thank you Pam for your help. One of the Eastern Rosella's seen here just before release. This Galah came in to care with a wing injury, no broken bones, but unable to fly. The wing was strapped by the vet, and it was then brought in to care with WIRES. 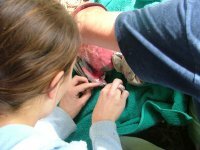 5 days later the strapping was removed and the galah now needed some time to regain strength in its wings, before being released. The Galah is seen here patiently waiting for his wing to regain strength, he was kept in a large flight aviary, and released 4 weeks after coming in to care. WIRES carer Alicia is seen here in the process of rescuing a juvenile Eastern Rosella, too young to care for itself, having lost the parent bird, it is now safely in care with WIRES. It will be released as soon as it is able to feed and fend for itself. The juvenile Rosella has been successfully released. WIRES NR received a call about an Echidna trapped under a movable bird aviary. I was asked to go out, and assess the situation, and see what could be done to help this animal. When I arrived, I immediately noticed that this was perfect Echidna habitat. Near by was bush land, and swamps, and very little human habitation. In fact, this entire road was stables, with Ballina Race Course at the end of the road. The callers met me in the drive way, and showed me where the animal was. Unfortunately, there were a few dogs on the property that had to be found, and locked away. Dogs in close proximity to native animals causes large amounts of stress which is not always evident to the untrained eye. Once the dogs were locked away, I was lucky enough to have a number of men around willing to help, who were able to tilt the aviary so I could get in behind it, and rescue the Echidna. 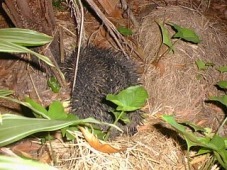 At this time of year, it is possible that the Echidna could have babies, known as puggle's close by, so relocating this fellow meant I had to release him in a very close geographical area. Luck was on this fellows side, and to have been found where he was, and I was able to relocate him just a few hundred meters away, in scrub land. A very happy result for one of natures wonders. concerned about the well being of this bird. He woke, and looked at me through the window. Because I was close, and because to him I am a predator, he immediately went into a threatening display. animal, and the rescuer dangerous situations. I was able to open a near by window, and hang out of the window to have access to the bird, but it was still out of reach. As a reptile rescuer, I have a snake bag in my car, and remembered it. I was able to use it to reach and secure the bag, which was a huge bonus to both of our safety! The bird was taken to a near by vet who was able to assess the bird, and although his body condition was good, his obvious visual appearance was not so good. He was bought into care, but unfortunately died a few days later. When we put out rat bait, it is not only the rats and mice that succumb to the poison. WIRES Northern Rivers received a call for help from a distraught house owner, he had put out bait and found a dead marsupial with 4 babies clinging to her dead body. 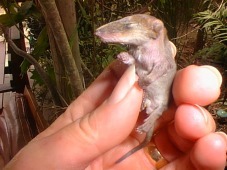 What he had found turned out to be native Dusky Antechinus. The babies were brought in to care, unfortunately often the young will also die as they drink from the mothers milk, already poisoned. 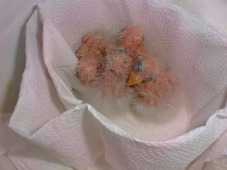 3 died not long after coming in to care, the last one, a female, is doing well. UPDATE : The surviving Antechinus has been successfully released. WIRES snake handler Rick went to the rescue of this unfortunate Eastern Brown snake, it had been trapped in orchard netting for 2 days. After cutting the snake free of the netting, very carefully, the snaked was given in to the care of Tony, one of WIRES Northern Rivers reptile carers. The snake also received veterinary treatment from Alstonville Veterinary clinic, as it had struggled to free itself, it had also tightened the netting around itself, receiving a number of wounds in the process. 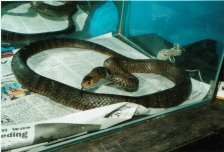 The snake is seen here a week later just before release. It was released in close proximity to where it was first rescued.